I’ve got a collection of photo albums in my upstairs closet. They’re all shapes and sizes: There’s a small black one that’s full of old photos of my grandfather; my mother’s album from her youth and college days; a red one with flip pages that my grandmother kept; one my father had when he was at Brown—lots of photos of him being a “sport,” skiing, playing tennis in his white shirt and flannels. And I’ve got a much bigger one that was given to my parents when they were married in 1942. It’s got some great photos of my pregnant mother, their cocker spaniel, and, finally, my brother John, who was born in Miami during WWII. My father was stationed there; he flew transport planes for the US Navy. There are lots of photos of him standing beside his plane in his flight suit—leather helmet, for crying out loud, leather jacket and funny dark goggles, baggy pants and all manner and kind of flotation devices. 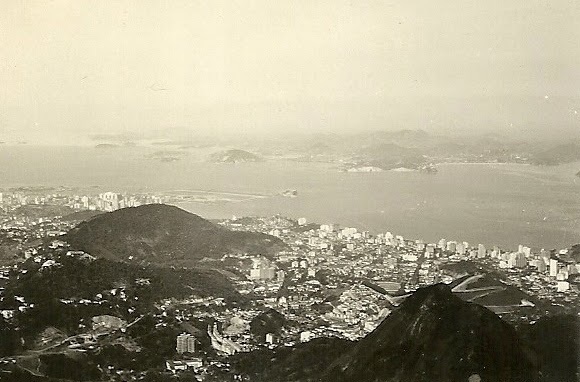 These photos are two my father took of Rio from the window of his airplane and pasted carefully in his photo album. In the top photograph, you’re looking down at Sugarloaf Mountain as well as a couple of others – there’s one called Two Brothers, but I can’t remember which one it is; there’s Copacobana Beach and Botafogo Cove; Ipanema Beach (of “tall and tan and young and lovely, the girl from Ipanema goes walking...”). And there’s downtown Rio, huge and sprawling out around every piece of land in between the mountains; between the mountains and the sea. 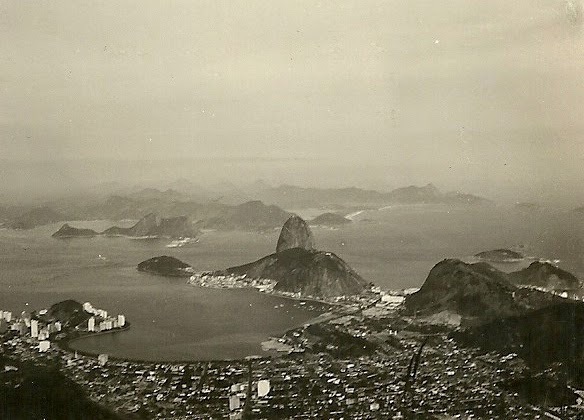 My father loved to fly, and he loved everything about Rio de Janiero—the food, the beaches, the music, the graceful samba. I have a couple of old Good Housekeeping magazines up on the top shelf of the closet in my office. Both are from 1923—one from April of that year, one from October—and I spent some time this morning leafing through the back sections, looking at advertisements. I was amazed...so many of the products advertised in 1923 are the same products I have in my kitchen cupboards today: Jell-O, Sun-Maid Raisins (not the seedless variety, though), SOS scouring pads, Pyrex ware, Pillsbury flour, Bell’s Seasoning, Lipton’s tea, Campbell’s Soup, Gulden’s mustard; all manner and kind of toothpaste, including Ipana. Most of the ads are in simple black & white; they’ve got solid block lettering and a simple collegiate border—quite boring, actually. The artwork is gorgeous—lush, full color paintings or line drawings, various typefaces (mostly serif faces, but a few sans as well); splashy, full-page blasts of color and copy! And the copy is incredible...Will you have good teeth in 1933? Have Hair that Thrills...Teachers and Mothers are Allies in Fighting Dirt...She never really knew why...(the ad implies she had halitosis and hadn’t yet discovered Listerine)! I love the bride, rouged and vague, sipping her Maxwell House! ...my old logic professor from college would have an absolute field day with this one! I can hear him now, questioning: Valid or True? I’ve got lots of old postcards, but I never can remember what’s on the front of them...Flowers, waterfalls, fat lambs with snowy fleece; windmills, mountain views, chickens or contented cows; old men sitting on stone walls, cheerful fireplaces in wayside taverns? I pay attention to the backside, to the messages written on the back; I search for the clever ones, the ones in secret codes, the ones that make me laugh out loud. I even published a book about messages on old postcards: Father is here...he’s as fat as a pig—you can Google it! I don’t know who Harry is, but I suspect he’s married to the woman to whom he sent this card in the early 1900s. It’s a photo of Hammond Street in Bangor, Maine, and Harry has numbered highlights on the photo and written the key on the side. The writer, Mrs. Willson, has crossed out the “South” in “South Union” and written “East” instead – she probably lived there, so I’m guessing she’s right. It’s 1903, and probably spring, since the river has washed over the wooden bridge! And, finally, the most sincere wishes of J. P. Lyman; white-shirted, vested, collared; a spiffy bow tie and a flower in his lapel. I don’t know about you, but I’d certainly go bowling with handsome JP Lyman...strike, spare or whatever! A trifecta here: a beard, great hair, an old 1885 portrait; there’s even amazingly bushy eyebrows—he’s got more hair than I do, for crying out loud! He is the Rev. Ebenezer Gay, born 1792 in Walpole, Massachusetts; his older sister, Rebecca (1789-1842) married John Allen Gould, my third great-grandfather...that makes him, I think, a great uncle of some kind. He went to Harvard, graduated in 1814; was ordained as a clergyman in Stoughton in 1818 and stayed there for five years. While in there, he married Laura Sanders of Wrentham, and they had five children. In 1823, “removed” (I love that old term) to Bridgewater and the Trinitarian Congregational church. He stayed there until 1842. He was active in town affairs, served on the School Board for the town and was a trustee of the academy of Bridgewater. In 1888, he went on to Tomkin’s Cove, New York, to live with his oldest son, the Reverend Ebenezer Gay, Jr.; another son was the Rev. Joshua Gay of South Wellfleet. A remarkable gentleman, to be sure. When I was little, though, his photograph was enough to scare the bejesus out of me – a little irreverence for the reverend. For me, getting my first bicycle was my ticket to freedom! We lived in Portland then, and my best friend lived down the street; I actually learned to ride on her bike, then got one of my own for my birthday; we rode all over the West End together. If my eighth birthday had been in 1902, I probably would have received a Sears “Josephine” bicycle (the boys’ model was called “Napolean”). It had wheels made of “the very finest swaged piano wire spokes,” high-quality hubs, bearings, an adjustable handle bar (with “internal expander,” whatever that was); it had a drop curved frame with dress and chain guards – can you imagine catching your 1902 long skirt in that chain mechanism? Also had handsome front and rear crown forks, double tube pneumatic tires; it weighed 28 pounds and came with a ten days’ trial period. In 1916, the Charles William Stores in New York (another mail order house) carried the “Overland Special” for only $23.95. It was available in three sizes (20, 22 or 24 inches), had rubber extension grips for the handle bars, a “saddle that is different,” and was “smashing all records for tremendous popularity.” Front sprocket had 26 teeth, rear had 8 or 9. Came in two colors: London smoke or battleship gray with a red head and red hairline striping. Also had mud guards – a great improvement over the earlier models. But if I’d turned eight in 1930, it would have been a Elgin Streamline bicycle – all models were named for birds – suggesting freedom, flight. Boys could have a Cardinal or a Blue Bird for $32.25; less expensive models were the Red-bird or the Oriole. Women and girls were limited to one model (why am I not surprised?) called the Swallow. The boys had options of headlamp, horn, luggage carrier and bike stand; they also had a choice of either a red or blue bike. Girls were limited to blue (see my comment above), but they got to have a “laced skirt guard,” which seems to me a rather dubious plus. I guess I was lucky: I turned eight in 1954, and by then, girls were allowed to wear pants for outdoor recreation – I never had to worry about catching my skirt/dress in the chain. I probably would have done it on purpose.